Our vineyard restaurant will, for one evening only, feature all Surrey Hills wine and local produce. Discover more by scrolling down. 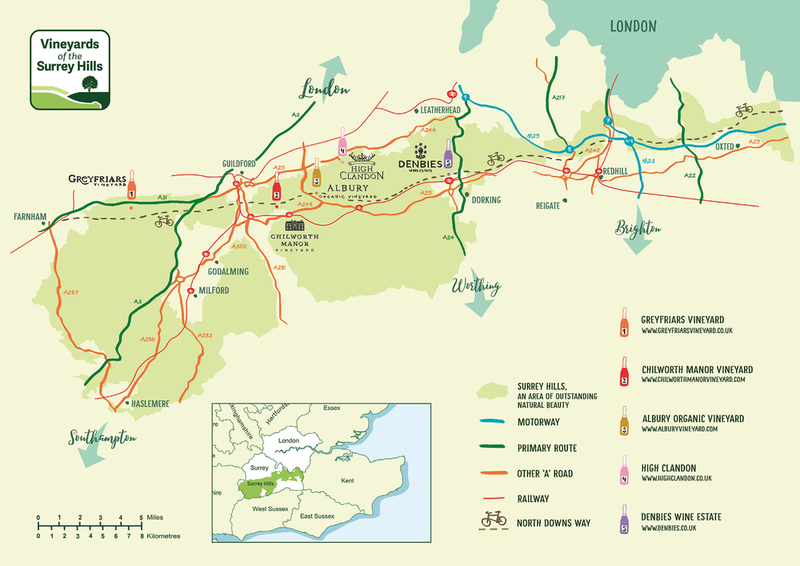 Just 20 miles from London, in the heart of the Surrey Hills, you’ll find Denbies, High Clandon Estate, Albury Organic, Chilworth Manor, and Greyfriars - five vineyards that have recently joined forces to celebrate the excellence of wines grown in this unique area of outstanding natural beauty. Nurtured on chalky limestone hills with the same geology as that of the Champagne region, these vineyards have a unique location and represent the very pinnacle of quality in the increasingly-successful English wine industry, having won top international awards for their wines and wine tourism. The Telegraph described High Clandon as ‘England’s best vineyard that you’ve never heard of’. But with a clutch of international awards including the IWC’s Cellar Door of the Year 2018, we have a feeling this boutique vineyard won’t be a secret for much longer. With panoramic views of the London skyline, High Clandon produces elegant English sparkling wine crafted from the classic trio of champagne grapes: Pinot Noir, Pinot Meunier and Chardonnay. Bees make a delicate honey from the wildflower meadow at the top of the estate and a Burgundian Truffle orchard planted next to the vineyard has recently begun to yield. Daniel Britten’s cooking is synonymous with Surrey. After reaching the quarter finals of Masterchef in 2008, he went on to win Surrey Life Magazine’s Best Local Menu and has been nominated twice for Surrey Chef of the Year. For this event, he will be cooking over an open fire using old vine wood and his menu will feature exceptional produce from the surrounding area. Emily Lambert is one of the youngest and brightest stars of the English wine industry. At just 20, she became the first female sommelier at the Ritz and recently won a million pound investment to open her own restaurant on BBC Two’s Million Pound Menu. For this event, Emily will be joining guests for dinner and introducing wines course by course. The vineyard is just 10 minutes from the A3, between Guildford and East Horsley. The full address is High Clandon Estate Vineyard, High Clandon, Surrey, GU4 7RP. Blakes Lane which leads up to the estate is practically opposite the National Trust’s Hatchlands Park. You’re welcome to drive and leave your car overnight at High Clandon and we recommend Beeline Executive Cars in Guildford to get you home safely when the event concludes at 10pm. Advance car booking on 01483 823232 is advised. Please take the time to read our FAQ section before booking a ticket. We'd like to draw your particular attention to the dietary restrictions and food allergies section, as well as the bits about the weather and children. We want you to have an amazing experience at A Table Outside, so it's key you understand how our events work before purchase. See that big ‘PURCHASE’ button? Click it now to secure your seat at our High Clandon table. Tickets are limited and we expect this event to sell out.